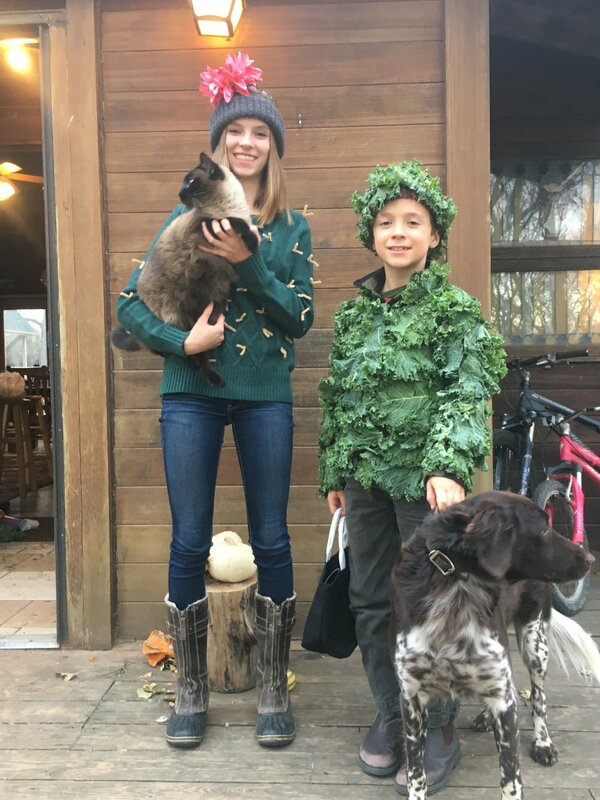 When I asked my nine-year-old son, Cale, what he wanted to be for Halloween this year, he said he wanted to be Kale with a “k”, since that is what everybody thinks his name is! I spent a little time trying to figure out how I could make a kale costume, and I finally decided that I would just cover some of his clothing in kale. Now, when I think of botanical clothing costumes, I think of floral designer Francoise Weeks. Check out her incredible creations on Instagram! I actually took a floral design course with her up at her studio in Portland, Oregon two years ago, so I thought it might be fun to put some of her techniques to use. I bought a heavy fleece shirt and found an old outgrown winter cap with a pom-pom on top. I went to the grocery store and bought a bunch of bags of curly kale. I actually ran into a friend and her eyes bugged out when she looked in my cart. I told her no, I was not on a juicing binge or something healthy like, that but instead was going to be making a costume for my son. She said oh, of course you are! I guess this is what happens when your mom is a florist. I have always enjoyed making creative costumes for my kids, but I do not tend to be one who goes to over-the-top. I just like the creative process of making our own costumes, whatever they might be. I stopped off at our shop and picked up some oasis cold glue and scissors and headed back to the house for a late night costume making session. I had my son put on the shirt and I began gluing the kale in layers starting at the bottom and working upwards. I wanted it to have curly little sleeves and for the Cap to have a curly Brim. After covering The hat and shirt, and covering my fingers entirely with that darn glue, I took the costume into a cold basement room and went to bed. The next day I took it and kept it in our floral cooler for the day while it waited for its school debut. Eventually it was time, and I headed over to my sons elementary school where I helped him get dressed up amidst peals of laughter and giggles from his friends. I was actually shocked that everyone for the most part got the joke and actually knew that it was kale on his costume. I guess this unloved vegetable surely has come into mainstream in recent years for an entire class of fourth-graders to know what it was. Not bad! Besides the hat being a little itchy and sweaty, Cale said he loved his costume. It did begin to wilt quite seriously after the two hour school adventure. I put it back in the cooler until the evening for trick-or-treating, added a few fresh Curly leaves, and it was ready for round two. Here are my kids dressed up for trick-or-treating. They are getting a bit old for it, but we have friends who live on our road who expect our children every year for the last 14 years to stop by, and they make all sorts of home-baked goodies for them. So I told my daughter she better dress up another year if she wanted the sweets! She came up with her own costume after browsing Pinterest. She was a cactus - green sweater with tan pipe cleaners tucked in as the spines and a flower on top of her head. I thought this was a perfect simple costume for a teenager. I, of course, enjoyed its botanical nature. It figures that she would be wearing a cactus, which is one of the plants that has become extremely trendy this year. Everly is always up on fashion! Their costumes were well received, and it was a particularly cold evening, so Cale's costume stayed nice and fresh. I would say that it did not hold up long-term very well, so by the end of the night it was completely wilted, and our friend suggested getting out a frying pan and some oil and garlic to cook it! Of course, she was joking, and we we simply threw it in the trash. It had served it’s purpose. I had a fun adventure, my son loved wearing it, and another Halloween passed leaving me feeling like a good mom for having made the time for my kids. It’s hard sometimes to do this with the business. I don’t pretend to be a super mom, or anything like that, but doing these little things to celebrate holidays and special events throughout the year is important to me and my family. These are the things I think my kids and I will remember. My husband always gets a kick out of my late night adventures and wonders why I didn’t just go to the store and buy a costume. Secretly I think he loves that I do this for the kids. He generally cleans up after me once I have created a colossal mess. Thank goodness for him! And now with Halloween over, our last wedding of the year completed this past weekend, it is now time to turn our thoughts towards Thanksgiving!